We recommend a soft bristled brush as opposed to a medium or hard bristle brush for the optimal health of your teeth and gums. We also suggest a smaller headed brush to get around each tooth more thoroughly. The Philips Sonicare for Kids has received outstanding reviews and may be a great oral care option. Does my child need to Floss? Yes, it is important to floss daily because flossing removes plaque between teeth where it is hard for a toothbrush to reach. A major contributing factor to gum disease is caused by not flossing. Once a child’s teeth start to fit closely together, usually between the ages of two and six, parents should start to get their children in the habit of flossing daily. We recommend a dental visit every six month. Although you may employ great oral hygiene habits, issues from genetic and other contributing factors may not be noticed without a dental professional. How old should my child be when I take them to the dentist? 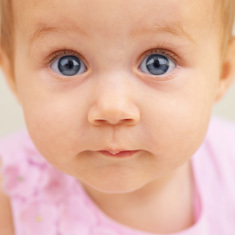 At the first sign of eruption or about the age of one is when a child should start seeing a dentist. How do I tell if my child has gum disease? All you can do is look for signs of gum disease. Symptoms of gum disease include consistent bad breath, receding gums, red or bleeding gums, new spaces between teeth and/or loose teeth. Because gum disease often begins painless, it is crucial to schedule regular dental exams. If you think your child has gum disease, schedule an exam as soon as possible. Are silver amalgam-type fillings safe? There have been some concerns about silver-colored fillings or amalgam fillings because amalgams contain mercury which can be toxic. A number of individuals believe these amalgam fillings are responsible for causing a number of diseases, including autism, Alzheimer's disease, and multiple sclerosis. The American Dental Association (ADA), the FDA, and numerous public health agencies say amalgams are safe, and that any link between mercury-based fillings and disease is unfounded. However, there are a number of other materials we can use in fillings other than silver-colored fillings. Should I wait for my child to be exposed to an X-rays? Fortunately, the dose of radiation your child is exposed to during a dental X-rays is extremely small. The radiation your child is exposed by the sun, minerals in the soil and appliances in your home within a year, is 20 times more radiation exposure than a dental X-ray. That's only 0.2% of all radiation exposure the average person receives. Children and Teens are at higher risk of developing decay in and are, therefore, the best candidates for dental sealant protection. It can be difficult for you to determine whether treatment is necessary. Often problems may go unnoticed until it is too late, and additional care may be needed. On the other hand, some visible issues may resolve on their own. This is why a regular six month dental exam becomes important. Out specialist can inform you of issues or potential issues and give you guidance on the best course of action. The American Association of Orthodontics recommends that your child be evaluated by the age 7. An orthodontic screening no later than this allows our orthodontist in Firestone, Colorado, to detect and evaluate problems that may exist. Dr. Garlock can then advise parents on whether treatment is necessary now or in the future. Technology has allowed orthodontic treatment to improve dramatically. 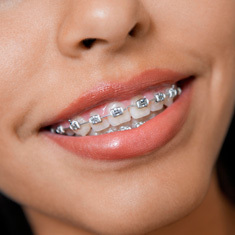 Typically, braces make your teeth tender and sore for a few days but are not painful. This discomfort can be relieved with over-the-counter painkillers. Our Firestone orthodontist, Dr. Garlock, uses the latest technology and techniques to ensure your treatment is as pain-free as possible.